Summary: What a day for the ages as far as chasing goes. My day started out the day before and was a whirlwind from start to finish. I started out basically with no chance of reaching the target as I was on the Sykes and delays piled one after another and basically made it next to impossible to get off the ship and drive from Chicago to the target area by May 10. That is until Ben came up with “Hey, fly to Tulsa and I will pick you up!” And the ball started rolling. We had to beat a ship into Port Inland, Michigan. Check (by 10 minutes and with gusts of gale force no less). Then I caught a ride with Fassbender Marine Market from Port Inland to Green Bay. Check. Rental car from Green Bay to Milwaukee. Check. Flight from Milwaukee to Houston. Check. Catch connecting flight to Tulsa……..uh oh! If someone can tell me why a plane leaves on time and is over an hour late to its destination, I am all ears. Needless to say I missed my connection from Houston to Tulsa. Next flight to Tulsa. Check. Meet up with Ben 10 minutes after landing in Tulsa. Check! Damn the torpedoes, full speed ahead. We targeted Enid and blazed a trail westward out of Tulsa. Had to make a quick pitstop in Perry to pick up a cheap tripod (would this be a GREAT decision!!) and then on to Enid. Saw numerous chasers in Enid as storms began to fire to our west. Storm motion was an INSANE 50-65mph. Started out in a pack with Shane and Bridgette, Mickey Ptak and a couple others. After we got to Medford it was every man for himself. Ben and I stopped well short of a SVR storm about 15-20 miles to our WSW. It soon went TOR warned and produced a very brief tornado. The inflow to the storm was very cool and Ben and I were discussing how this was going to kill this storm. It wasn’t 5 minutes and an extremely rapid meso and wall cloud formed about a mile to our immediate west. We were in absolutely perfect position. A funnel formed and soon after multiple vortices were ripping trees out of the ground and throwing them around the near side of the tornado. A brief but very nice Satellite Tornado formed on the outer edge of the main circulation and rotated about 3/4 of a mile away from us. The main tornado had violent motion and was very mesmerizing to watch. It was coming right at us. We got about 1:35 worth of video and had to get out of Dodge. As we retreated to the south a giant barrel approx 6-8′ in Diameter blew across the road about 100 yards ahead of us. When we finally found a decent east/west road option the tornado was long gone. We tried our best to catch up, but the storm rapidly sped away. Soon after, more TOR warned storms fired south of us and we were out of position for them. We raced east to try and get far enough ahead of the southern storms to hopefully make an intercept south far enough ahead of them we wouldn’t have to punch the core. Wrong. No matter how hard we tried, it was one core punch. Then another. 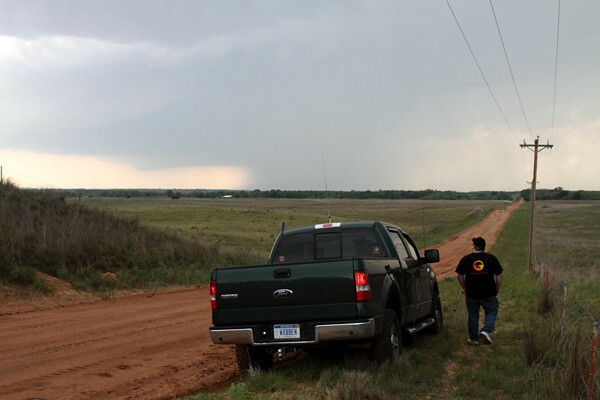 The first core punch we did was east of Blackwell, OK, between Pawhuska and Burbank. After seeing many leaves falling from the sky during the punch, we emerged to see a rapidly rotating wall cloud that produced a very brief spin up. It soon became disorganized and off we went after our next storm. This was the storm that went thru Moore and Shawnee, OK and sadly killed 5 people. By the time we punched thru that core, it was on its last leg. It had great structure and approximately 60mph inflow winds, but soon died out and became very disorganized. We chased it from Muskogee to near Sallisaw before we called it a night. Score 5 tornadoes for the day. A day that was 42 hours long! Ben sizing things up near Medford, OK.